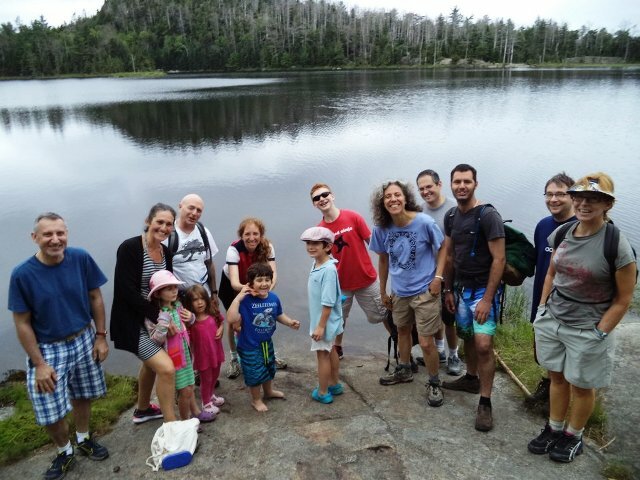 Our annual Adirondack Shabbat features a brief service al fresco, lunch, and a swim in a beautiful secluded pond, north of Schroon Lake, about an hour and 10 minutes from downtown Saratoga Springs. This is a short (0.6 mile), easy hike (NOT a climb), suitable for the less-than-ideally-fit and for families w/ small kids. We will meet at the trailhead at 10:30am. Bring a bag lunch, bathing suit and towel, sun screen and bug spray. Click here to RSVP, as the Rabbis wait for everyone at the trailhead. Directions: Northway to exit 28. Right turn at exit. Right (south) on Rt. 9 for 0.6 mile. Left on Alder Meadow Rd. for 2.1 miles. Take left fork, Crane Pond Rd, for 1.4 miles to parking area. Take sharp right and continue .85 mile up very bumpy road to head of trail.